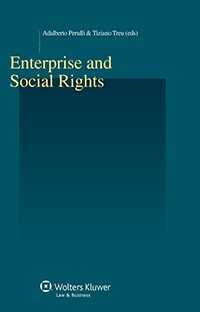 Enterprise and Social Rights is the first book to focus on the ‘theory of the firm’ as it reveals itself in today’s world from a multidisciplinary perspective. It underscores the necessity to rebuild a new scientifically controlled paradigm that acknowledges and regulates the dimension of power in the functioning of the organization. Globalization has led to growing labour fragmentation and widening of gaps in social protection. Although the enterprise is increasingly expected to be socially responsible, in actuality, extreme worker inequalities and social dumping have become ubiquitous worldwide. With attention to innovative developments in Germany, Italy, Japan, and other countries, analyses include case studies of specific companies as well as case law, in particular, the European Court of Justice’s jurisprudence in matters of collective dismissals, seconded workers, and public contracts. the persistent limitations that women face in the workplace, even when worker participation is advocated. In their head-on tackling of the fragmentation and blurring of social responsibility in enterprise organization, these important chapters propose a view of the enterprise as a factor in a new ‘constitutionalization’ of labour that shifts employment protection from single legal entities to the network’s economic activity, thus realigning the legal boundaries of the enterprise with its economic reality. As a compelling investigation of how a satisfactory implementation of labour standards in the fragmented enterprise can be guaranteed, this book will be useful to entrepreneurs, managers, consultants, corporate lawyers, judges, human rights experts, and trade unionists, and it will be welcomed by academics and researchers in industrial relations and labour law.